Every so often, a foreign language film makes a such a huge impact that it crosses over to serious Oscar consideration among the usual English-language fields of the major award categories. As the awards circuit has shown, "Amour" may turn out to be one of those films. It should already come into the Oscar ceremony with 1 nomination secured - Best Foreign Language Film, which it could very well win. The more interesting question though, is whether it will show up in some of the bigger categories. The most obvious possibility is Best Original Screenplay, where it should be able to find a spot like other Foreign Films have done before. Even though "Amour" a chamber piece, I actually feel like it's a more of a directing triumph than a writing showcase. It may not seem as distinct as other auteur styles (Quentin Tarantino, Wes Anderson), but the directing is just as meticulous. The mostly motionless visual framing and the dark, cold mood felt like very conscious directing choices to me. I doubt he'll get this nomination, but I think the Academy's directing branch will also notice this, putting him into the mix for Best Director. Another strong possibility is in the Best Actress category, where Emmanuelle Riva could certainly pick up the first Oscar nomination in her lengthy career. The precursor awards haven't been as kind to her as initially anticipated, but she's certainly still in the race. Finally, the most significant indicator of crossover success will be whether or not "Amour" is able to land a nod in "the main event". It's definitely a tough sell, as the film will prove challenging for some voters to sit through. However, the film has enough of a high profile to be a serious contender for a Best Picture nomination. All of these nominations could go either way, so we won't really know until the nominations are announced. I just hope that Academy voters will give this film the consideration it deserves. Good review. It's an emotionally-draining flick, but rightfully so by how hard and raw it is with it's real, tender human emotions at-hand here. Great performances across the board, I just don't think they'll get the nominations they deserve. 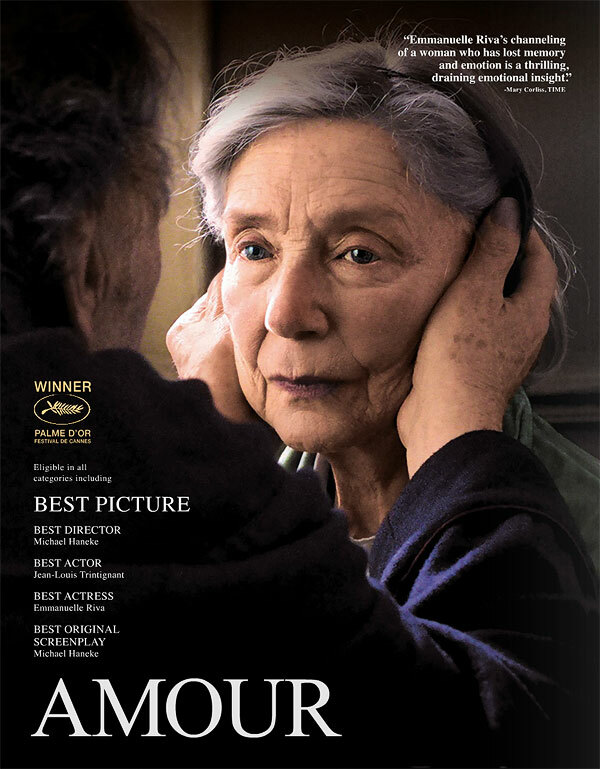 Amour is currently my film of 2012.